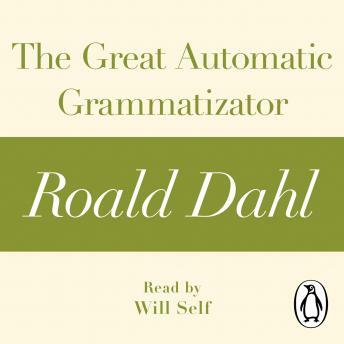 Penguin presents the audiobook edition of The Great Automatic Grammatizator by Roald Dahl, read by Will Self. In The Great Automatic Grammatizator, Roald Dahl tells a sinister story about the darker side of human nature. Here, a powerful computer designed to help people starts to supplant them . . . The Great Automatic Grammatizator is taken from the short story collection Someone Like You, which includes seventeen other devious and shocking stories, featuring the wife who serves a dish that baffles the police; a curious machine that reveals the horrifying truth about plants; the man waiting to be bitten by the venomous snake asleep on his stomach; and others.